Human beings were swimming at a time when Australia was the exclusive domain of Aborigines. Yet, in terms of a modern sport that provided the world with Hollywood's Tarzan, Buck Rogers and Flash Gordon, the staging of the Olympic events in Sydney will mark swimming's homecoming. No other nation on earth is as passionate or knowledgeable about swimming. Walk down any beach there or stroll into a shop in a sleepy village, and you can strike up a conversation about the sport, its stars, even its politics - in the same way that you might do the same over football in Europe. Make it big in swimming in Australia, and you are made for life. Ask Kieren Perkins, winner of the 1,500 metres freestyle in Barcelona and Atlanta. Now attempting to make his third Olympic Games and earn selection to an Australia team that is likely to be headed by Ian Thorpe, 17, in Sydney, Perkins is a millionaire with his own TV show. Thorpe will be guaranteed the same level of riches if he hits the jackpot in the Homebush pool as Australia battle with the United States for supremacy of the sport. Many coaches, rivals and swimming observers see Thorpe, known as "The Thorpedo", as living proof that swimming has entered a new time zone, so phenomenal have his swims over 200 and 400 metres freestyle been in the past two seasons. When the Olympic Games was last held in Australia, the 100 metres freestyle was won in 55.4sec. Thorpe is just a stroke short of covering the 400 metres at the same speed each 100 metres and would be some 45 seconds ahead of the then great Murray Rose, a fellow Australian, over 400 metres - about a length and a half of an Olympic pool. Such breathtaking performances as Thorpe's might well be expected. After all, swimming has been around since the dawn of time, water being the source of life. Written testament to early swimming falls within the past 3,000 years. The Bible, the Iliad, the Odyssey all contain references to swimming. Thucydides noted the activity in scripts that are 2,400 years old. 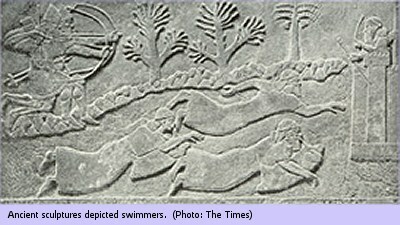 Many of the world's ancient civilisations swam, including the Egyptians, the Phoenicians, Persians, Romans and Greeks. Plato once declared that anyone who could not swim lacked a proper education, and Julius Caesar was known for his swimming prowess. In terms of competitions, the Japanese can point to evidence that races were held 2,000 years ago. The "modern" sport can be traced back to English clubs in the 1830s, when breaststroke was the most common manner of moving through water. Names such as Otter Swimming Club in London and the Leander Swimming Club date back to the 19th century. Yet even there, it was a little like reinventing the wheel. When a race was held in London in 1844, invitations were sent far and wide - even to NativeAmerican. Several turned up, and shocked crowds by winning comfortably by using a windmill action with their arms that was not too far removed from today's front crawl, the stroke used in modern freestyle races. Despite the Indian "innovation" (some of those ancient bas-reliefs indicated that overarm actions may have been used thousands of years ago), breaststroke remained the most commonly used stroke until the late 19th century, and in terms of leisure swimming - take a look along the lanes of your local pool - might still be said to be the easiest and therefore most popular stroke. Captain Matthew Webb swam breaststroke when he became the first person to swim across the English Channel in 1875. A contemporary of Captain Webb was J. Arthur Trudgen, an English swimmer and coach who lent his name to the Trudgen stroke, which used a breaststroke kick but an overarm action that he had seen used by South American Indians. The Trudgen was adopted around the world but then adapted by Fred Cavill, an Englishman who had emigrated to Australia. Cavill had developed the technique by watching South Sea Islanders. Instead of the breaststroke kick, Cavill used a "flutter-kick" like that seen among today's front crawl specialists such as the Thorpe, whose massive size-16 feet act like propellers at the end of his legs. The technique became known as Australian crawl, a term that lasted up to the days of Murray Rose and John Konrads in the 1950s and 60s before simply becoming front crawl.